Newly reduced shipping on this and all other items! The price we charge for shipping is the actual price for postage. It depends on the total weight and size of your order. Add an item to your cart to see the total calculated shipping. If the items you receive are damaged, or you are unhappy with your order, please contact us and we will refund or reship to make it right. We never share any of your information. All payments are handled by Paypal, one of the oldest and most secure payment processors. You may read more about it from Paypal's Security Center. 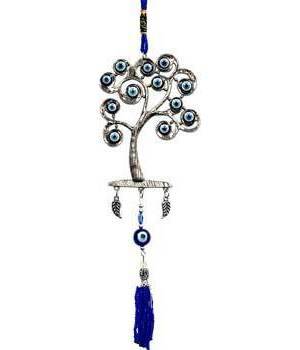 Combining the good luck and protection of the trees with traditional nazar blown glass beads, this multiple eyed talisman may aid the owner in protection from all manner of misfortune and negative energy. This potent charm may be hung on the wall, above an entryway, in a window, on a door, or from whatever one may choose to help increase protection through the awesome energy of trees, this item is approximately 10 inches in total length. Black Pentagram Chime 9 1/2"